Meteors ? popularly referred to as"shooting stars" ? are generated when debris enters and burns up inEarth?s atmosphere. But astronomers have found that some meteor swarmscorrespond closely to the orbits of known comets.? In the wake of the recent close pass of CometHartley 2,it is interesting to note that our Earth is currently interacting with thecosmic leftovers from a far more famous icy wanderer: Halley's Comet. And more meteors spawned by comets are expected to giveskywatchers a cosmic show in upcoming weeks. Right now, in fact, we are sweeping through some of thedust that was shakenloose from Halley?s Comet as it runs along its gigantic orbitalloop from the vicinity of the sun all the way out to Neptune. These tiny comet crumbs ram into our atmosphere at highspeeds to create shooting stars, which we call the Orionidmeteor shower. There are actually two points along Halley?s path, whereit comes relatively near to our orbit. One of these points corresponds to earlyMay and causes a meteor display that emanates from the constellation Aquarius,the Water Carrier. The other point lies near the late October part of our orbitto produce the Orionids. In May we meet the "river of rubble" shed bythe comet on its way outward from its nearest approach to the sun, while inOctober we encounter the part of the meteor stream moving inward toward thesun.? The meteors are moving through space opposite or contraryto our orbital direction of motion. That explains why both the Aquarids and theOrionids hit our atmosphere very swiftly at 41 miles (66 km) per second ? onlythe NovemberLeonids move faster.?????? Another distinguishing characteristic that October'sOrionids share with the May Aquarids is that they start burning up very high inour atmosphere ? possibly because they are composed of lightweight material. This means they likely come from Halley's diffuse surfaceand not its core. Unfortunately, 2010 is a poor year for the Orionidsthanks to the presenceof the moon, which turns full today (Oct. 22). It will flood the sky all night long with its brilliantlight right on through the weekend. So although the Orionids are currently neartheir peak, producing hourly rates of around 20 per hour, most of these streaksof light will likely be obliterated by the bright moonlight.? Still, an exceptionally bright Orionid, darting from outof the region of the constellation Orion (from where we get the name"Orionid"), might still be glimpsed.? The best time to look would be in the early hours of themorning; the stars of Orion dominate the southern sky around 4 a.m. local time.After this weekend, Orionid activity will begin to slowly descend. The laststragglers usually appear sometime in early to mid-November.? But by then, the moon will no longer be a factor andanother meteor shower will take center stage. 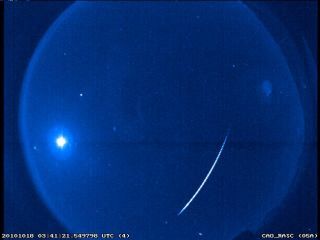 The Taurid meteors, sometimes called the ?Halloweenfireballs,? show up between mid-October and mid-November. But between Nov. 5-12will likely be the best time to look for them this year, taking into accountboth their peak of activity and the fact that the moon will be new on Nov. 5,offering no interference whatsoever. Even when the moon widens to its first quarter phase onNov. 13, it will still set before midnight, leaving the rest of the night darkfor meteor watchers. After the moon sets, some 10 to 15 meteors may appear perhour. They are often yellowish-orange and, as meteors go, appear to move ratherslowly. The Taurid meteor shower's name comes from the way thesemeteors seem to radiate from the constellation Taurus, the Bull, which sits lowin the east a couple of hours after sundown and is almost directly overhead byaround 1:30 a.m. In the case of the Taurids, they are attributed to debrisleftby Comet Encke, or perhaps by a much larger comet that upondisintegrating, left Encke and a lot of other rubble in its wake. The Taurids are actually divided into the NorthernTaurids and the Southern Taurids. This is an example of what happens to ameteor stream when it grows old.? So what was originally one stream now diffuses into acloud of minor streams and isolated particles in individual orbits. These crossEarth's orbit at yet more widely scattered times of the year and coming frommore scattered directions until they are entirely stirred into the general hazeof dust in the solar system.? The two radiants lie just south of the Pleiades. Soduring the first couple of weeks of November, if you see a bright, slightlytinted orange meteor sliding rather lazily away from that famous little smudgeof stars, you can feel sure it is a Taurid.? Because its orbit passes rather close to Earth's youmight be wondering if Comet Hartley 2 can produce any kind of meteor display.The answer is yes, although at the present time, we could hardly call it ameteor shower.? We currently pass closest to the orbit of Hartley 2around Nov. 2, but at the moment our respective orbits are too widely separatedto produce much more than a few meteors during the course of an entire night?swatch.? However, if the calculations of Russian astronomerMikhail Maslov are correct, Hartley 2 is destined to provide a spectacularmeteor display for us in the distant future. Using a method which he calls "verticaltrails," Maslov forecasts that in the year 2055, we will encounterconsiderable amounts of comet debris shed by Hartley 2 from 1985 right onthrough the first half of the 21st century. On Nov. 2, 2055, between 9 and 10 a.m. GMT (UniversalTime), Maslov predicts a display of meteors with "high brightness." They will appear to emanate from the constellation ofCygnus, the Swan, not too far away from the beautiful double-star Albireo. Thiscould turn out to be a true "storm" of meteors, producing anywherefrom 1,000 to 1,300 per hour.? Especially to all of our younger readers, I can only say,mark your calendars! Joe Rao serves as an instructor and guestlecturer at New York's Hayden Planetarium. He writes about astronomy for TheNew York Times and other publications, and he is also an on-camerameteorologist for News 12 Westchester, New York.